The Undergraduate Finance Committee released its allocation decisions for the $1.1 million Student Activities Budget on Friday. The budget is similar to that of the previous year other than a $7,000 increase in allocation to both the Special Programs and Events Committee and the Programming Board, because of increased security measures on Green Key weekend and student event funding requests. 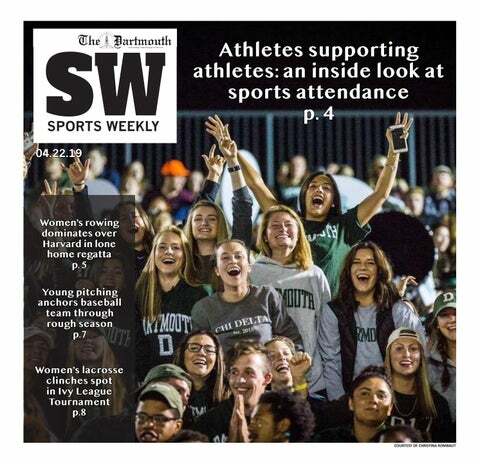 Council on Class Officers received $29,500; Homecoming Bonfire, $33,265; Greek Leadership Council, $39,782; Student Assembly, $44,000; club sports, $48,095; Dartmouth Outing Club, $53,139; Collis Governing Board, $84,576; SPEC, $176,442; Council on Student Organizations, $280,000; and PB, $328,202. The budget for the 2017-2018 fiscal year was $1,117,000, an increase of $17,000 from the previous year, according to UFC chair Brian Mc Gartoll ’19. The UFC funds for the next fiscal year comes from the student activity fee charged to each student’s tuition this year, which is currently $89 per term. The College’s fiscal year begins in the summer term and ends at the conclusion of spring term. Mc Gartoll said much of the $17,000 increase in the budget went to SPEC and PB. SPEC, which funds programs hosted by undergraduate student organizations that require more than $5,000, has seen an increase in funding requests for events like PRIDE week, Mc Gartoll said. Beginning last year, PRIDE has lasted two weeks instead of one. PB’s increase in funding was in response to the new security protocols, including wristbands for entry and a barrier for the Green Key concert, Mc Gartoll added. The funds allocated to other organizations mostly remained the same compared to those of the previous year. The DOC, club sports and GLC saw an increase of $1,347, $1,283 and $938 in funding, respectively. On the other hand, CGB and the Homecoming Bonfire received about $100 less than they did last year. The Council on Class Officers saw a $500 decrease in funding, while the allocated budget of COSO and the Student Assembly remained the same. The Student Assembly has received a fixed allocation for several years, Mc Gartoll said. The UFC advises the Office of Student Life on allocating the student activity fee. It is comprised of nine student members, nine organizational representatives from the College’s campus organizations, a non-voting chair and two non-voting advisors: associate dean of student life Eric Ramsey and student life coordinator Juliann Coombs. There is no organizational representative for the Homecoming Bonfire, as the allocated funding only goes toward material and building costs, Mc Gartoll said. Mc Gartoll said members of the UFC met every Monday this term. He added that the first several meetings were dedicated to discussing each organization’s expenditure of the previous fiscal year’s budget, unexpected expenses and trends in increasing costs. During the next few meetings, organizational representatives presented their budget proposals and explained why their organizations should receive the proposed amount of funding. Afterward, the UFC voted to agree on a final budget allocation. Most organizations did not end up receiving the full amount of money they initially asked for, Mc Gartoll said. DOC president Alex Lochoff ’17 said the organization initially requested $61,152, more than the $53,139 it received. The funds that it received from the UFC, which will supplement the funds the organization already receives from its endowment, will be used to make outdoor activities by its member clubs more affordable as well as expand and support student trips during school breaks, he added. Lochoff said the DOC requested more money this term because rising student participation in its trips over the past few years has increased the costs for transportation, lodging and equipment. In the past year alone, the DOC organized nearly 8,000 unique activities for a total of over 50,000 student involvement hours, according to Lochoff. COSO board member Connor Regan ’18 said the organization asked for $280,000 at the start of this term, which was the same amount of money it requested last year. Regan said nearly all of the funding COSO receives from the UFC goes toward supporting student events. He added that COSO has seen a general trend in the number of student events on campus as well as the amount of funding for them over the years. COSO is comfortable with the size of its budget at this point, but its proposed budget to the UFC in the future will depend on the number of requests it receives for student events on campus, according to Regan.